Maryland Coast Guard Lieutenant indicted after planning terror attack in U.S.
BALTIMORE, Md. — A federal grand jury has indicted a U.S. Coast Guard Lieutenant on charges of having weapons and prescription drug violations in an effort to plan a terror attack. 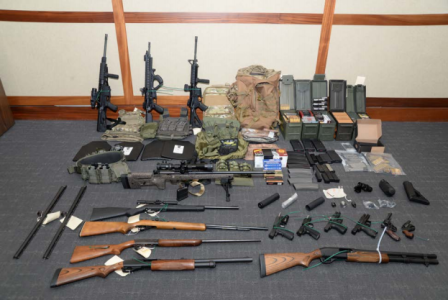 According to court documents, a search warrant executed at 49-year-old Christopher Paul Hasson's home on February 15, led officials to find seven rifles, two shotguns, four pistols, two revolvers, an assembled firearm silencer, and a disassembled firearm silencer. The indictment also states that Hasson had possession of an opioid substance called tramadol. Hasson is "an unlawful user and addict of a controlled substance" and therefore not allowed to own the 17 firearms found in the search, according to the indictment. In addition to the items found in his home, Hasson is believed to have made a list of targets for planned attacks. The targets included media personalities and Democratic Congressional leaders. Hasson faces a maximum sentence of 10 years in prison for each of the three charges related to the illegal possession of weapons. And a maximum of one year in prison for possession of tramadol.